This month we are celebrating both International Women’s Day (8th March) and World Poetry Day (21st March). Therefore, we are showcasing material held in the Special Collections and Science Fiction Foundation collections which contains poetry written by women who personally or professionally impacted greatly on their respective field of literature. 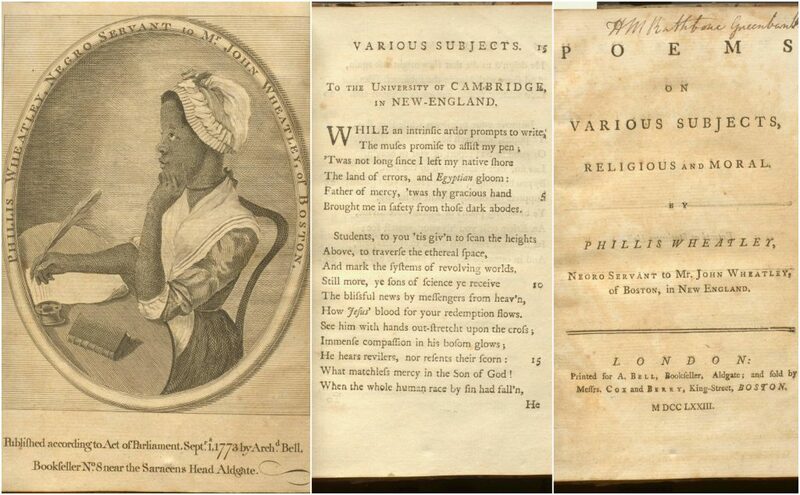 Poems on Various Subjects was authored by Phillis Wheatley. Phillis was purchased as a slave by John Wheatley, a Boston Merchant and Tailor, in 1761. She was tutored by John’s children in reading and writing, and wrote her first poem ‘To The University of Cambridge, New England’ at the age of 12. She was relieved of her domestic duties by the Wheatley family, and encouraged to continue working on her literature. An illustration of Wheatley by Scipio Moorhead, another Boston slave, is provided in the frontispiece; the below extract is taken from a poem within the volume written by Wheatley in return. Our copy belonged to one of the William’s of the Rathbone family (by date most likely IV or V), as signed on the title page. To S.M. a young African Painter, on seeing his Works (p. 114). 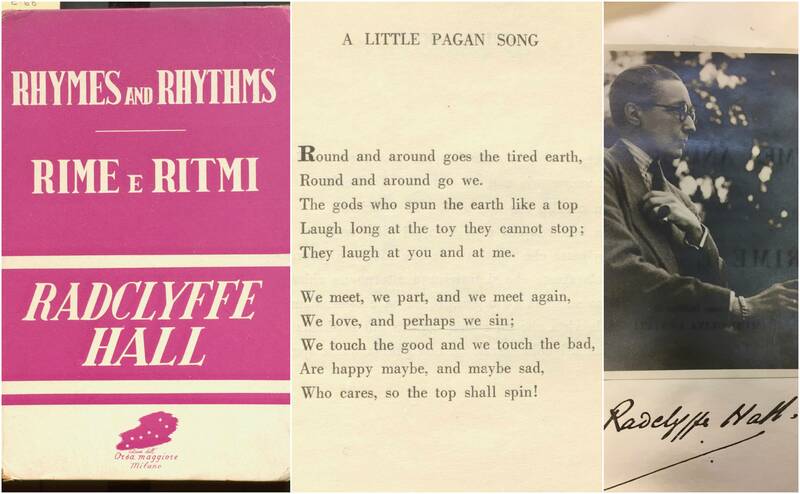 Rhymes and Rhythms was published posthumously in an edition of only 500 numbered copies in Milan. Our copy from the Zania collection is numbered as “5”. The text is provided in both the original language of English as well as Italian. Radclyffe Hall (1880-1943) is best known for her work The Well of Lonliness, which when published in 1928 was subject to a trial for obscenity and banned in Great Britain. A self-described “invert”, she lived with two long-term female partners during her lifetime, hence the dedication page inscription “Dedicated to Our Three Selves”. And an organ monkey coughing and small. Was a nightingale in a six inch cage. 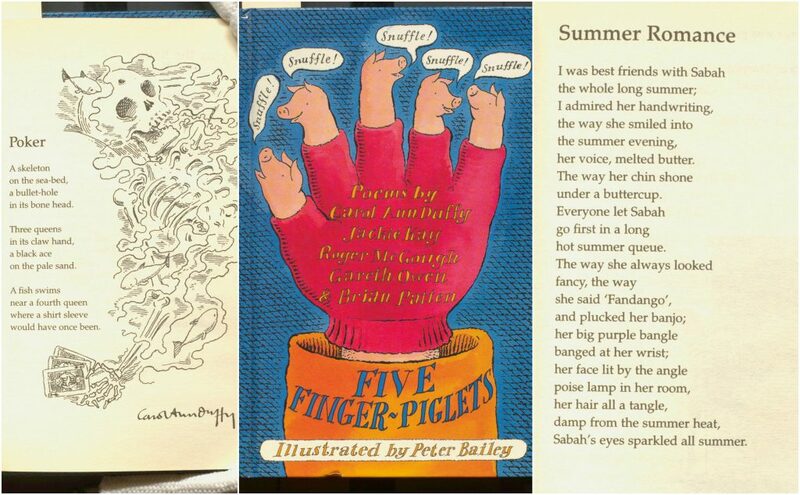 Carol Ann Duffy and Jackie Kay contributed to this anthology for children, Five Finger Piglets: Poems. Duffy was appointed poet laureate in 2009, and she is the first woman, first Scot, and first openly LGBT person to hold the position; Kay is the third Scottish Poet Laureate, appointed in 2016, and also identifies as LGBT. Our copy of the anthology is held in the SPEC Patten series, as Brian Patten also contributed to this volume. The poetry is understandably centered upon many themes that would be familiar to children (such as friendship disputes at school and losing a ball in the neighbours garden), but, nonetheless, the volume is a excellently fun read for adults, too. I crawled along the pine floor to my father’s bed. It was empty. Just a white pillow and a headrest. My dad gave a large guffaw from the balcony. said, ‘Got you there didn’t I? when what we’ve got is parent’s instead? 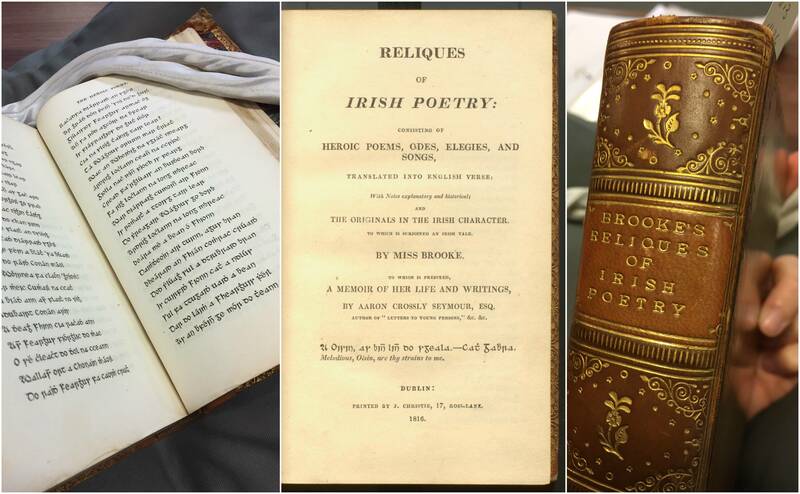 Reliques of Irish Poetry was first published in the late eighteenth century. Brooke (c. 1740–1793) was passionate in the preservation of Irish culture and heritage through translating traditional poetry. Our beautiful gilt-tooled calf-bound copy of the 1816 reissue includes an extensive biography of Brooke’s life, as well as poetry and prose in both English and Irish. The text contains poetry of varied types, including quasi-epic style heroics, elegies to loves lost, and odes to wars. Winds and tides in vain opposing. As one of the most influential female Science Fiction authors of all time, Ursula K. Le Guin (1929-2018) is best known for her fiction, including The Left Hand of Darkness (1969; which won both the Hugo and Nebula awards in 1970). 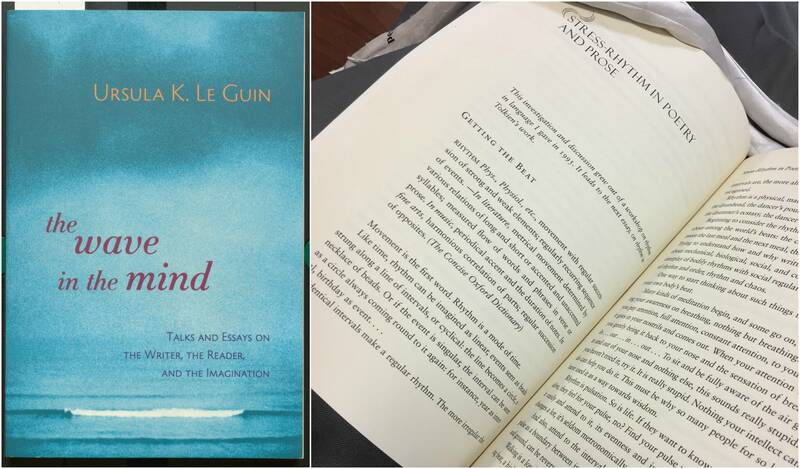 However, in her 2004 collection of non-fiction essays The Wave in the Mind, she explores themes including the family, on being a woman, Tolkein, and writing. One particular interesting essay is her thoughts on stress rhythms in poetry and prose; she demonstrates, using various texts, the technique and necessity of reading with stress and rhythm in mind. All the above can be consulted in the reading room. As usual, please do contact scastaff@liverpool.ac.uk for more information. This entry was posted in 18c printed books, 19c printed books, 20c printed books, Children's Books, Liverpool Poets, Lucrezia Zaina, Rathbone family, science fiction, Special Collections, Uncategorized and tagged Brian Patten, International Women's Day, poetry, Science Fiction, Special Collections, Zania by scastaff. Bookmark the permalink.